Molly Wizenberg is my hero! I’ve never had banana bread this good EVER! It domed perfectly – had a slightly crispy crust and tasted AWESOME! I’m not nearly as poetic as she is about it in her book “A Homemade Life” and I’m not even going to try. Do yourself a favor and pick up a copy of this book – it’s captivating – she’s thoroughly delightful to read – and it’s all about her life in food, short essays that make you want ot create EVERYTHING she’s written about. This was the first recipe I HAD to try. 1 1/2 Cups mashed RIPE Banana – 3-4 bananas – MEASURE it! Stir just to combine – DO NOT OVER MIX! Bake in center of the 350°F oven until a toothpick inserted in the center comes out clean. such a perfect and tasty looking loaf! Molly Wizenberg’s book is one of my favorite food books. Though, of course, it’s about much more than food. 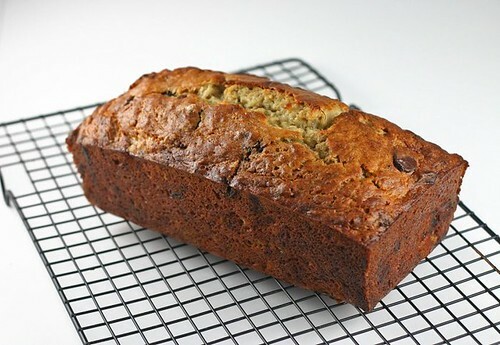 I remember this banana bread catching my eye, but have never got around to trying it. Looks fantastic! I have not heard of her before, but I will have to check her out because that banana bread looks amazing! This does look great…I like the addition of the crystallized ginger, thanks for sharing the recipe! Chocolate and ginger…wow. 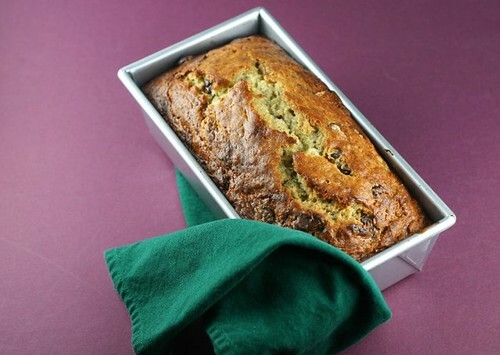 This has to be an awesome banana bread! I will have to check out the book. what a nice kick to put in those crystalised gingers! I love banana bread! The crystalized ginger is a twist. It looks like a deliciously healthy loaf that I’m gonna have to try! Waht a beautiful loaf of banana bread! I have to try this recipe with the crystallized ginger. Hey Mary, you know I love banana bread! The ginger sounds great. I saved this one for later baking! I have been searching for a banana bread that domes perfectly. Glad you said this one did because that means I will have to try it. Looks beautiful. This looks great! I may have to try it! I made this last night and it was wonderful! I used a little less butter and a little more yogurt and it turned out great. Thanks for the recipe! ……….and thank YOU for letting me know how it turned out for you! You’ve got me thinkin’ that I’ve got to try more of Molly’s recipes.